At least that's what it looks like up in the Sierra. We've written about the massive tree damage in the Sierra, a combination of many years of drought weakening the trees, and then a major infestation of Pine Bark beetles, that's left something over 100 million trees dead. You can see this at just about any point that offers an overlook of a forest: huge swaths of brown trees among the living green ones. It's a very sad sight. Well, it's apparently time to do something about that; at least where people live and use electricity. In our little community above Sonora, we counted at least six different tree companies at work, some of them from as far away as Alabama and Florida. And they were taking down every dead tree that might threaten a power line in any way. We were happy to see this work get done. 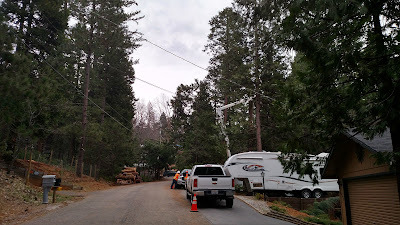 It's quite impressive to see these guys work, sometimes more than 100 feet off the ground, and dropping limbs, trunks, and whole trees down in your neighborhood. Yeah, there were flagmen and road closures, but all in a good cause. And on just about every street we saw huge piles of logs stacked up. Sadly most of this is pine, not really great firewood, and not great lumber either. So much of it may not get used for anything important. 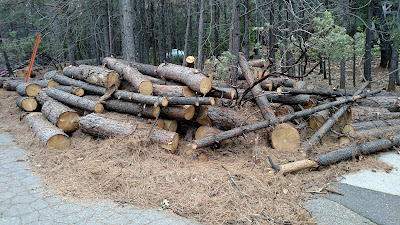 Some of our neighbors were cutting and splitting it, figuring that free firewood is free firewood. Another friend is planning to make a rustic fence out of some of the logs. We were lucky this year, in that we didn't lose any trees. We had three taken down last year. Two got chopped up for firewood. One is now playing a featured role as the side barriers for our informal bocce ball court.